Bunch ran the story, "9/11 'Black Box' Cover-up at Ground Zero?" on his popular Campaign Extra! political blog and promised it will see hard-copy in PDN soon. Philadelphia, 10/28 — Bryan Sacks’ and Nicholas Levis’ breaking story on the amazing disappearing black box recorders from the WTC site was picked up and expanded by the Philly Daily News’ Pulitzer Prize-winning reporter Will Bunch below. Two men who worked extensively in the wreckage of the World Trade Center claim they helped federal agents find three of the four “black boxes” from the jetliners that struck the towers on 9/11 – contradicting the official account. Both the independent 9/11 Commission and federal authorities continue to insist that none of the four devices – a cockpit voice recorder (CVR) and flight data recorder (FDR) from the two planes – were ever found in the wreckage. But New York City firefighter Nicholas DeMasi has written in a recent book — self-published by several Ground Zero workers — that he escorted federal agents on an all-terrain vehicle in October 2001 and helped them locate three of the four. His account is supported by a volunteer, Mike Bellone, whose efforts at Ground Zero have been chronicled in the New York Times and elsewhere. Bellone said assisted DeMasi and the agents and that saw a device that resembling a “black box” in the back of the firefighter’s ATV. Their story raises the question of whether there was a some type of cover-up at Ground Zero. Federal aviation officials – blaming the massive devastation – have said the World Trade Center attacks seem to be the only major jetliner crashes in which the critical devices were never located. And officials for the FBI – which oversaw the cleanup at Ground Zero – and the New York City Fire Department repeated this week that the devices were never recovered. The “black boxes” – actually orange – could have provided valuable new information about the worst terror attack to ever take place on American soil. The cockpit voice recorder uses two microphones to capture the sounds of the cockpit for the last 30 minutes of a doomed flight on a tape loop. In the case of the hijacked 9/11 jetliners, the devices should have captured any conversations or actions involving the hijackers, as well as radio transmissions. 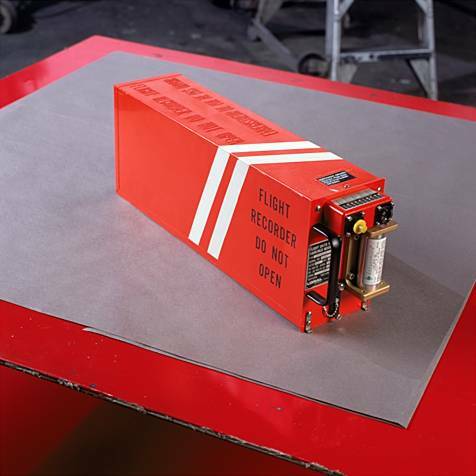 The flight data recorder records things like airspeed, heading, and altitude. Both devices – located in the tail of the airplane – emit loud “pings” so they can be located even in ocean jetliner crashes, like the 1996 explosion of TWA Flight 800 off Long Island. They are built to survive an impact of enormous force – 3400 Gs – and a fire of 1100 degrees Celsius for one hour, somewhat higher than official estimates of the World Trade Center blaze. “It’s extremely rare that we don’t get the recorders back. I can’t recall another domestic case in which we did not recover the recorders,” Ted Lopatkiewicz, spokesman for the National Transportation Safety Board, told CBS News in 2002. However, officials said little of the jets was recovered. DeMasi was with now defunct Engine Company 261 in 2001. He wrote up his recollections of the Ground Zero recovery in a glossy book self-published by a group that calls itself Trauma Recovery Assistance for Children, or the TRAC Team. The book was published in 2003 but received little notice. Efforts over several days to locate and interview DeMasi, who is now said to be with the FDNY’s Marine Unit, were not successful. But his account was verified by another member of the so-called TRAC Team, recovery site volunteer Bellone. He recalled FBI agents arriving for the search one day in early October, setting up their equipment near Brooks Brothers. He said he didn’t go out with them on the ATV but observed their search. At one point, Bellone said he observed the team with a box that appeared charred but was redish-orange with two white stripes. Pictures of the flight recorders on the NTSB and other Web sites show devices that are orange, with two white stripes. “There was the one that I saw, and two others were recovered in different locations – but I wasn’t there for the other two,” Bellone said. He said the FBI agents left with the boxes. If the account by DeMasi and Bellone is true, it’s not clear what motive federal authorities would have for claiming they weren’t found. By the same token, however, it’s not clear what incentive either man would have to lie. An FBI spokesman in New York, Jim Margolin, said after checking with the leader of the Ground Zero investigation that none of the boxes were recovered. Bellone has encounted some unrelated problems in connection with the TRAC group, however. In April, the New York Post reported (story not available online) that TRAC owned money to a number of creditors, including the company that published the book. Fire officials also told Bellone, who was made an honorary firefighter by a New York engine company, that he couldn’t wear an official uniform on school visits. This is the more comprehensive version of our story appearing in today’s Philadelphia Daily News.